Cows. Crops. Sewers. Thanks to the 'Internet of Things' trend, the world is now full of crazy, wirelessly connected stuff. Here are some of the wildest. Yes, we now live in a world of Wi-Fi-controlled paper. Paris startup ReaDIYmate makes Internet-connected paper toys that move and play sounds, depending on what's happening in your digital life. For example: When you get an email from your mother-in-law, the creature sitting on your desk can run around screaming "oh no!" or play a funereal dirge. 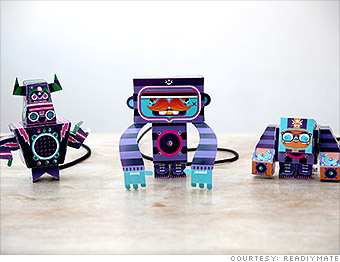 If a Facebook friend likes your photo, the paper toy can dance around to a happy beat. "Some 'Internet of Things' designs are about being super-useful, but we think there's a place for fun objects," says ReaDIYmate co-founder Marc Chareyron. "There's usually no emotional connection to technological objects, and we wanted to change that." Customers can choose from about 20 artist-designed toys or create something all their own. Within each toy is a small motor and speaker. They attach to a teeny "computer brain" that contains an MP3 decoder, 2GB of storage and a Wi-Fi chip. Users have to plug their ReaDIYmate into the computer just once to set it up, and then it becomes entirely wireless. The creature's behavior is controlled with a Web interface, where customers can select actions and sounds to go with notifications like a new email or tweet. Sounds can be selected from an online library, or users can upload their own MP3s. The startup received more than $27,000 in April through a Kickstarter crowdfunding campaign, and Chareyron says the company plans to start shipping the devices in September. The kits are $109 for a basic model, which doesn't include a paper skin. The toy and "sculpture" models are an extra $20.